Before my friend Paddy Sweeney headed off to guide another group of hardy cyclists from coast to coast across the Pyrenees mountains, he was posting photos daily on his Pyrenees Cycling facebook page of the floods in the valley near his home in Saint Savin, France. 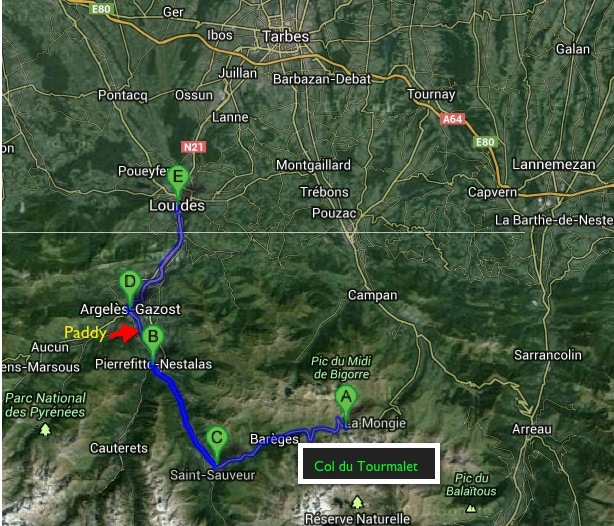 Myself and a number of friends have now visited Paddy in the Pyrenees at his La Lantern Rouge Cycling Lodge. We think of him daily as he reported first on record-level late snowfall and then on the destructive floods which last week angrily raged down the valleys into populated towns below, causing major destruction. When a friend, Bill, whom I had met at Paddy's place in 2010 wrote to me to suggest that I post something about the floods because "not much had been written in mainstream cycling news," I realized I had been so wrapped up in watching Paddy's daily posts I had forgotten to tell the story myself. Cyclists pepper the well-known climbs in this area. 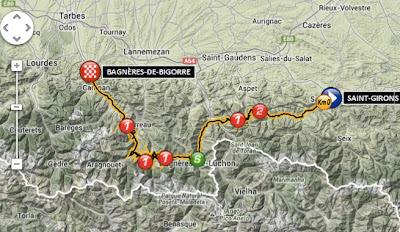 The climbs of the Tourmalet, Aubisque, Hautacam, Luz Ardiden, Soulor, Aspin, and others are out the back door. The Tour de France typically stays in this area for 3-4 stages every year, but in some great twist of good luck, this year the 100th route will only include 2 days in the Pyrenees mountains. The recent floods have been devastating. The main flooding period took place between June 18-20, 2013. But the clean-up and repairs will take many months. 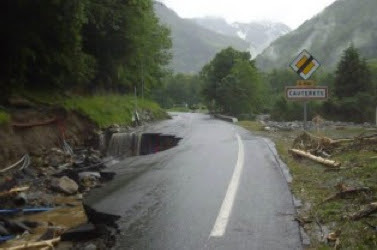 Roads have been wiped out with major damage to the west side road leading to the Col du Tourmalet, plus many small villages along the borders of the regions rivers. Nearby, residents and tourists were trapped up the road at Cauterets where the one road in and out was washed out. Three days of very hot weather preceded the floods. Below, Paddy took this photo on June 21st of the town where Paddy, his wife Olive and their son Sean live in Saint Savin. Read Paddy's update here: The Great Flood and see more of his photos or follow his FB page for cycling photos and updates on conditions in the Pyrenees. If you are a cyclist - you will not be able to ride to the top of the Col du Tourmalet from the west side. Yesterday Paddy and his group of cyclists were successfully able to ride to the top of the Tourmalet from Campan / Sainte-Marie-de-Campan, on the East side. Paddy reports the city of Bareges, on the west side, well-known to many of us who have traveled in the area, was devastated and was evacuated by the Army. Repairs will take months. Lives and businesses have been changed. See video of the town of Pierrefitte-Nestalas, a village between Luz Saint Sauveur and Lourdes. Watch as the helicopter flies down the valley near Saint Savin, where Paddy lives up on a small hill safe from this devastation. Flooding occurred in some areas planned to be featured in Stage 9 of the TDF on July 7th. The town of Luchon (Bagneres du Luchon) was under water but most of the roads and bridges remained intact. The nearby town of St Mamet was badly hit. 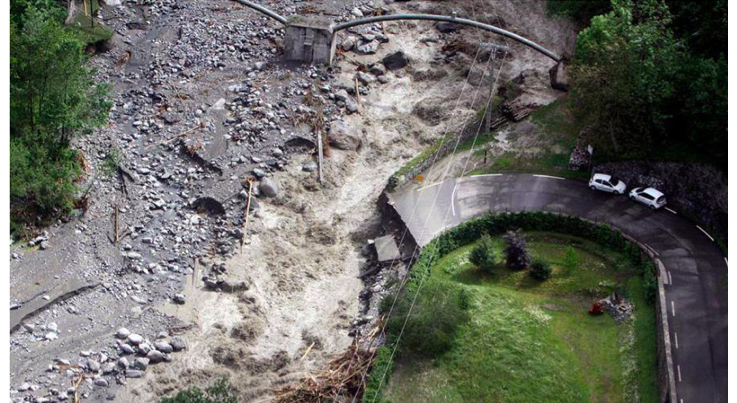 It is unknown at this point whether organizers will need to reroute Stage 9 if repairs are not completed; these repairs are a priority and the towns are confident of the route and that the Tour should not be affected. Stage 9 of the 2013 TDF is 1 of 2 big stages in the Pyrenees this year. 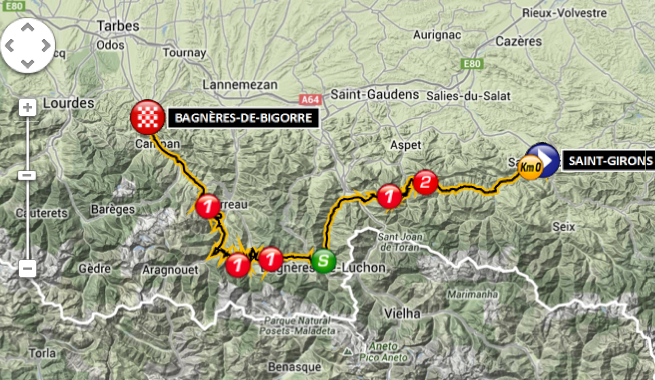 You can see that Bareges and Lourdes are just to the west of the stage route. The town of Luchon is marked as a Sprint points location on the Stage 9 route map above. Video footage in St Beat, down valley from Luchon, and directly on the route, show high waters flowing through the streets. 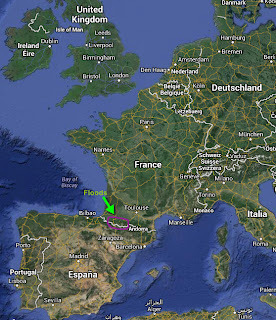 The city is receiving rapid attention as it is a major gateway to Spain. 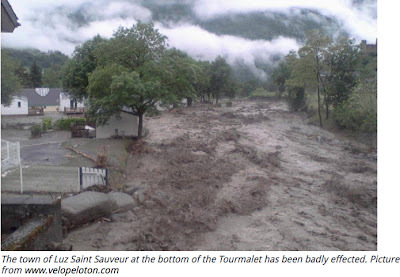 Some of the photos Paddy has been posting are featured in the article including this one of the damage in Luz Saint Sauveur. Luz is a village I have very fond memories of passing through on a bicycle over the years. It is so hard to see the damage and imagine the townspeople uprooted. The Pyrenees mountain range separates Spain from France, with some of the highest points along the border. 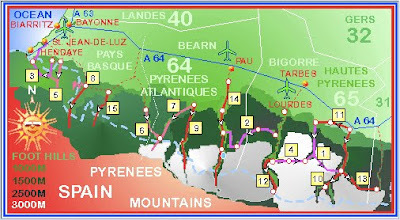 To understand the French Pyrenees is to understand that a series of almost parallel valleys run north from the mountain peaks, with high flowing rivers of snow-melt reaching into the lush farmlands below. Paddy lives near Argeles-Gazost in the Valley Laveden down valley from the Cauterets Valley labeled on this map. 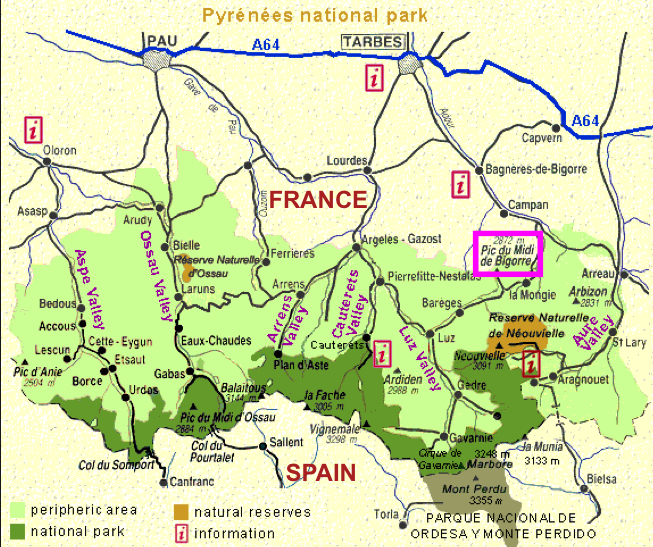 To learn more about the Pyrenees read two of my previous posts: The Valleys of the Pyrenees and The Valleys of the Pyrenees in Pictures. I wish everyone well and hope that safety, businesses and homes are soon restored.